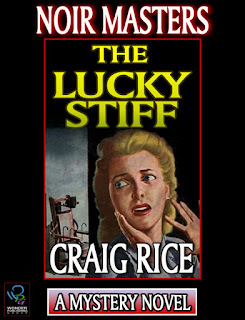 I picked up Craig Rice's 1945 novel The Lucky Stiff because someone had put it on a "Ten Best Noirs" list. It's not noir*, but it is a high-water in fast-talking, hard-boiled crime fiction with far more empathy for the accused than most crime writers try, let alone pull off. I'm about two-thirds of the way through the book, and only twice, for a total of two or three words, has a laugh line seemed even slightly forced or cheap. The rest to the time Rice juggles humor, suspense, domestic interludes, and dark empathy, and keep all the balls in the air. And now, your question: When does humor become too much in a crime novel or story? When the humor is just right, and what makes it so? Here are two previous posts about Craig Rice (Click the link and scroll down). And here's an article about the Craig Rice touch from the Rue Morgue Press website. * OK, maybe The Lucky Stiff is noir. I shall be happy to discuss this further once you have all read the book. Humor is such a subjective thing, isn't it? If it works for you, it can't be too much. Seana, have you read Rice? I wouldn't say she's exactly a forgotten crime writer, but she was fantastically celebrated in her day (cover of Time, and all), and she hasn't been mentioned much in the midst of a current rediscovery of American woman crime writers of the 1940s and '50s. She does not appear in Sarah Weinman's upcoming Library of America volumes, for instance. Maybe she's not quite as dark psychologically dark as Dolores Hitchens or Charlotte Armstrong or the queen of them all, Patricia Highsmith. A case of her being sold short because some of her stuff was humorous? A case of her having been too popular? Disfficulty in obtaining rights? Taste? Whatever the reason, she remains worth reading. I have read at least one Rice and possibly more, but it was a long time ago. I liked her stuff. I think it may even have been Lucky Stiff that I read first. It was in an era where they were trying to revive books by people like Mary Roberts Rinehart in mass market form, but I'm not sure if the strategy worked on anyone but me. I think I possibly liked the idea of what Rice was trying to do more than that I found the books laugh out loud funny. Seana, in the 1980s Bantam reprinted a bunch of her books. In the 1990s, IPL reprinted them again. The strategy was fairly successful. Peter, I don't think that Craig falls into the domestic suspense category as Armstrong, Highsmith or Dorothy Hughes does. Rice's books are more the surreal category which would include books like EQ's There was an Old Woman. The rights would have been available. I talk to the estate on a regular basis, following my bio of Rice. I cannot warm up to humor in crime fiction. When I have stumbled upon examples, I have no enjoyed myself. Perhaps I have no sense of humor. In any case, I suppose my mind remains open to reading well-crafted first-rate humor in well-crafted first-rate crime fiction. But I haven't found that combination yet. I have never read a word by Mary Roberts RInehart, but I have all kinds of preconceptions about her based on her use of three names and the fact that one of those names is Mary. That all sounds too cozy to me. So, what books of hers should I read if I want to find the truth? Rice is not laugh-out-loud funny the way, say, Donald Westlake could be. Her humor makes itself felt in the form of wisecracks rather than comic situations. It would not shock me to learn she had read The Thin Man. Jeffrey: I should have realized that the rights would have been available. She seems to have been reprinted by quite a number of publishers: Rue Morgue Press, that Noir Master series, and at least one other publisher whose name slips my mind. R.T., I have come across other readers who are no fans of comedy and crime. The combination can work both in cases like that of Donald Westlake, who wrote outright comedy is his Dortmunder novels, and in Allan Guthrie and the books Ken Bruen writes with Jason Starr. The best humor in those books generally occurs at the darkest moments, and the sheer incongruity can be very funny. Then there are writers like Charlie Stella or John McFetridge, whose humor one might call naturalistic. Their characters crack jokes the way you or I might in similar situations but somehow do not expect characters in crime stories to do. Peter, in trying to come up with a particular title out of several I read a long time ago, I found this review which I think is very just and gives examples of her style. The description of her "tart, slightly smirking, enormously intelligent writing voice" is quite apt. That said, I don't know if she would up your alley or not. I just learned on my hunt here that she was a war correspondent during WWII. Anyway, I found them very enjoyable at the time I read them. Thanks. I shall try in the future not to judge writers by their names. "Tart, slightly smirking, enormously intelligent writing voice" sounds good to me. I see Jonathan Latimer's name mentioned in connection with Craig Rice's. I had forgotten about him. I love the Westlake Dortmunder books and also the Hoke Mosley books. Adding a secondary character that brings a bit of humor to a book can be a good choice. The Dortmunder novels will naturally occur to anyone who thinks about this matter. It helps that people don't generally die in them, which might ease the apprehensions some readers might feel about the combination of comedy and crime. Westlake has fun with his characters' foils and their predicaments, but he does not make light of death. Yep Hoke Mosley. The tone there is just about perfect. I wont mention the ones where the tone is all wrong of which there are many examples. Yep, Willeford was master of tone, and not just in the Hoke Mosley books. The Shark-Infested Custard, in addition to being the best title I have ever known, captures the atmosphere of unmarried regular guys hanging out in Florida just beautifully. In fact, I don't remember much about what happens in the novel, but I remember what it must have been like hanging with those guys. Over-the-top humor can work beautifully, too, at least when Ken Bruen is doing, especially in the Brant and Robers novels and in his three (very soon to be four) collaborations with Jason Starr. I feel remiss because I haven't read The Shark-Infested Custard, though I have read and liked Willeford, and I haven't read any Ken Bruen outside of the Jack Taylor novels, which I love. You might like The Shark-Infested Custard just for the look it offers at how a bunch of guys in Florida live. The Brant and Roberts novels are faster, looser, and more unhinged than the Jack Taylor books. Yeah, sounds like its kind of the next level for both these writers. You mean time for you to move on to the Brant books and The Shark-Infested Custard? I would think of that not so much as th next level, but rather the next step in a voyage with no beginning and no end. Getting to this thread very late but HOME SWEET HOMICIDE was certainly in the early mix of titles we considered for Women Crime Writers (I love that book tremendously.) But tonally it doesn't quite match up with the others in the set, and there was certainly a lot of strong writing by women in the 40s & 50s! Sarah, I have had cause to reconsider my statement that The Lucky Stiff is not noir. And your suggestion that "Home Sweet Homicide" does not quite match your choices tonally will stick with me. What I've read of Rice has less of that feeling of being in uncertain psychological in even the calmest moments of a story that I associate with some of the authors you chose for the set. 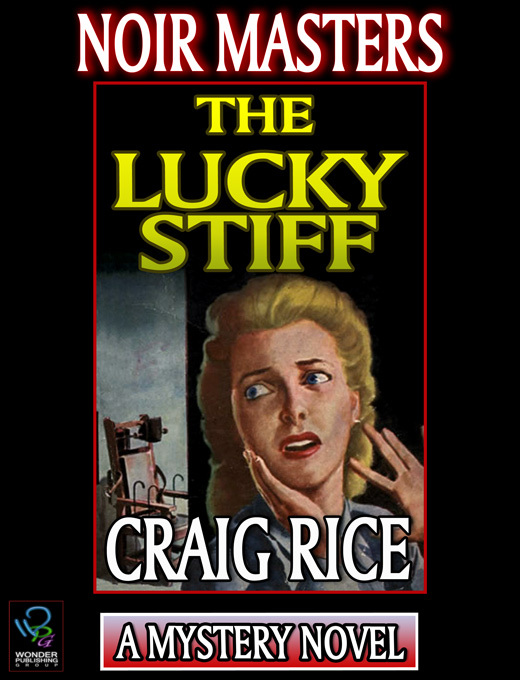 Even acknowledging that THE LUCKY STIFF is noir, she sometimes veers in a Norbert Davis direction--not something I can say for your other authors. Wow! I didn't know she could do that! What do history and crime mean to you?